At long last, April! April is here! This month is known for a variety of notable days (did you know that April 13th is Peach Cobbler Day, April 17th is Cheeseball Day and April 23rd is National Cherry Cheesecake Day?) with arguably the most popular being Easter on April 20th. Along with the little suits and dresses to pick out, plastic eggs to fill and hide, and baskets that need to be stocked with goodies, it's time for spring baking! Easter always seems like the perfect holiday to signify the arrival of warmer weather and to break out the pastel sprinkles, egg shaped cutters and marshmallow animals. The number of Easter desserts out there are so fun and so...YUM! One classic recipe that has been passed on for decades and decades in families everywhere are the easy and tasty Rice Krispies treats. The crunchy cereal mixed with the sweet marshmallows is a timeless combination that is enjoyed year-round, but what if it was given a bit of an upgrade in time for spring and Easter? 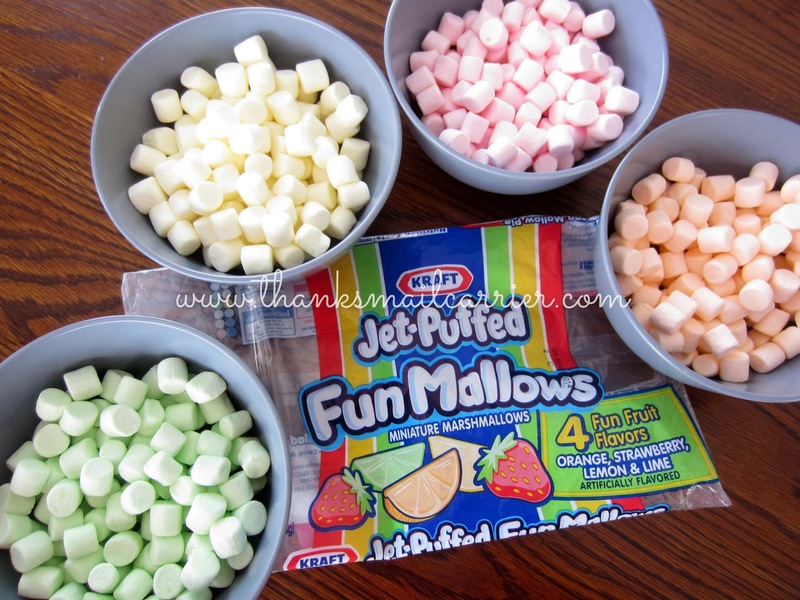 I'm always looking for an excuse to eat Kraft JET-PUFFED Marshmallows and have an especially soft spot for Kraft JET-PUFFED FunMallows in their orange, strawberry, lemon and lime flavors. 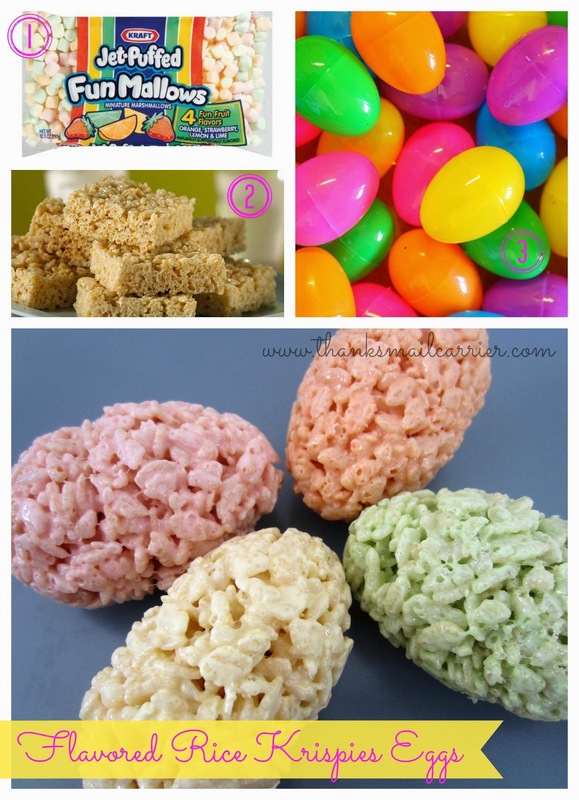 So, with a little sorting and a little creativity, bring on the Easter happiness with Flavored Rice Krispies Treats Eggs! Sort FunMallows into each of the four colors. In a small saucepan melt 1 Tbsp butter over low heat. 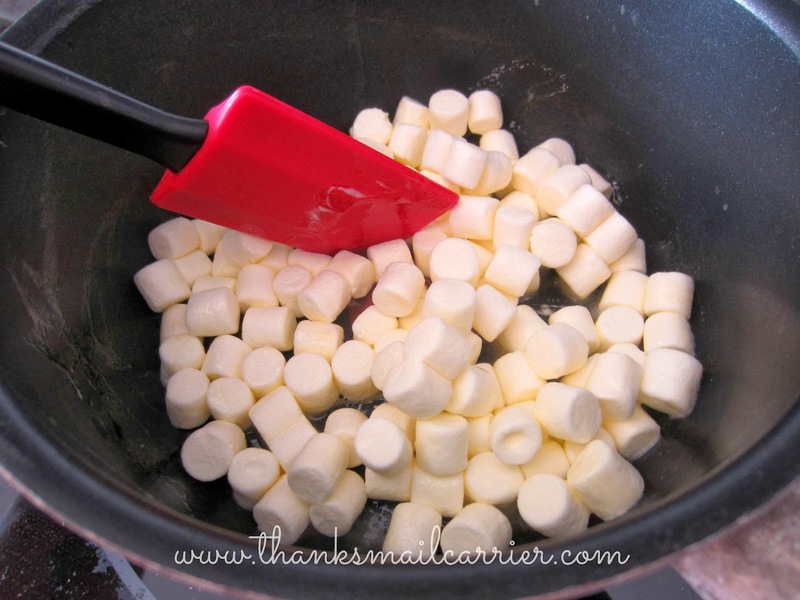 Add one color FunMallows and stir until completely melted. Remove from heat and add 1½ cups of rice crispy cereal. Stir until well-coated. Coat the inside of your plastic Easter eggs with cooking spray, being sure to grease your hands at the same time. Scoop and press the cereal mixture into each half of the plastic egg. For small eggs, fill until barely over-full and then snap each half together. Wait 5 seconds and remove from the molds, place on wax paper to cool. For large, filled eggs, use your fingers to form a small, hollow center in each half of your egg before removing from the molds and placing on wax paper to cool. After large eggs have cooled slightly, place your choice of candy or chocolate into one half and gently press the two halves of the egg together, making sure to create a tight bond and cover the seam. When your lucky recipient breaks into this colorful, tasty egg, they will find a sweet surprise waiting inside for them! 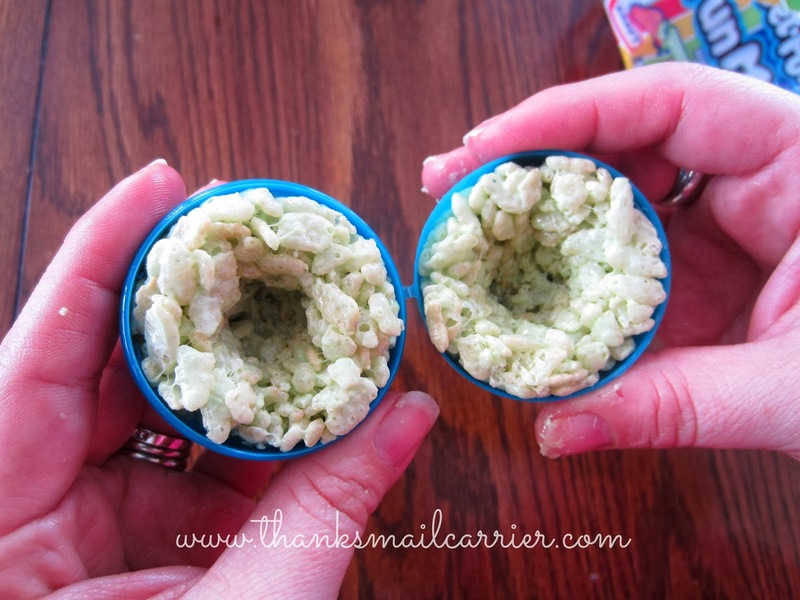 Whether filled with a surprise treat or not, I absolutely love the way that the flavors of the Kraft JET-PUFFED FunMallows come through in these eggs! Delicious! With so many great Easter recipes, crafts, decor and more for spring, now I just have to decide what to try next! Are you inspired to start your spring cooking and baking yet? 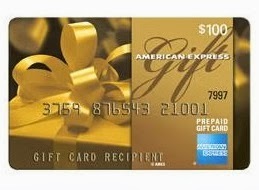 One lucky person will win a $100 American Express gift card! Pizza is wonderful anytime of the year. The layered pizza dip sounds like a winner for my family. I am going to try the Asparagus-Pasta Toss ...it looks simple and delicious! I would like to try the Banana-Caramel Toffee Cake. It would be perfect for our Easter Brunch. Double-Lemon Cheesecake Bars! They sound so refreshing!! I like to add something new to Easter Brunch every year, and I think the Sunburst Fruit Salad looks good! I would like to make the Cheesy Cornbread Casserole. I would love to try the Sunburst Fruit Salad. The Spring Chicken Salad sounds amazing - will definitely try it! The chocolate cake roll and bacon wrapped water chestnuts look amazing! I like the double lemon cheesecake bars. Cute idea!! I would love to try the flower power cupcakes! When the recipe site popped up the first thing I saw and really want to try is the Double-Lemon Cheesecake Bars! They look delicious! The double-lemon cheesecake bars caught my eye! Would love to make the Cute Carrot Cupcakes for Easter dessert. Asian Toasted Sesame Asparagus sounds (and looks) wonderful, and possibly the Breakfast Strata. Bacon & Potato Egg Strata but replace the potato with cauliflower. The double lemon cheesecake bars sound amazing! I like the Baby Chick Cake for Easter! I would love to try and make the Classic ANGEL FLAKE Coconut Cake! The one-pan orange chicken sounds and looks good! I like the flower pot cupcakes. I'd like to try the sesame pineapple chicken stir fry recipe. It looks great. I would love to try the beef stuffed rice balls! The Mock Mimosa and The Rainbow Cake look amazing! I tried the surprise eggs last year. Stupid me, I didn't use big enough eggs! It was more trouble than it was worth and they didn't really seal together probably. Next time I 'll use the smaller eggs and no filling :) Much better idea, thanks! Double lemon cheesecake bars, sound refreshing and delish. I love the eggs you made~super cute! The Easy Layered Boston Cream Pie looks delicious. I would like to try Greek Quinoa Salad recipe, with a touch of some kale and spring mix. I would love to make the lemon poke cake. I would like to try the Swiss and Chicken Casserole. OMGoodness the SUnburst Fruit Salad looks like something I'd love to make for the springtime. Love the colors of the recipe. I would love to try the double lemon cheesecake bars! I would like to try the Banana-Caramel Toffee Cake. The Spring Time Asparagus looks awesome! I'd love to make the Bacon Water Chestnuts! The deviled eggs with ham, Mock Mimosa and the Flower power cupcakes all look like good recipes to try. Id love to try the Double Lemon Cheesecake Bars! the bunny cake for sure! I would like to try and make the Pink Lemonade Cookies. Two of the recipes from their site that I love are the ones for Bacon Omelet Roll with Salsa and Sky High Brunch Bake. Either would be great for a special brunch. 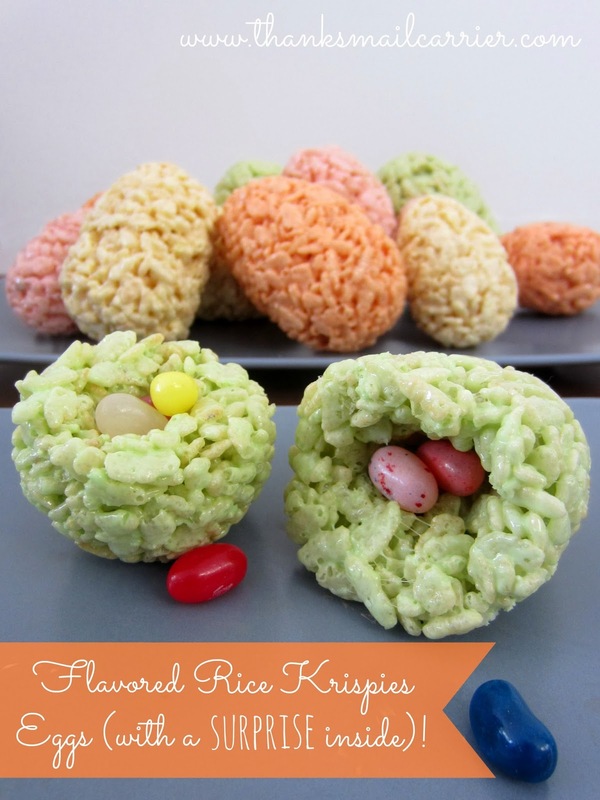 I really like the rice krispie eggs, such a cute idea. I'm going to make the Double Lemon Cheesecake Bars. They look so yummy. The Baby Chick Cake is so cute! I might try that out. I love the BAKER'S ONE BOWL Easter Egg Brownies - my kids would love decorating their own brownies! I also love the Mini Cheesecake Baskets... so fun! I want to make the Chicken and Waffle Tacos. They look so good! I want to make the Easy Layered Boston Cream Pie. I would love to make the Double-Lemon Cheesecake Bars. They look so delicious. I like the Shortcut carrot cake. 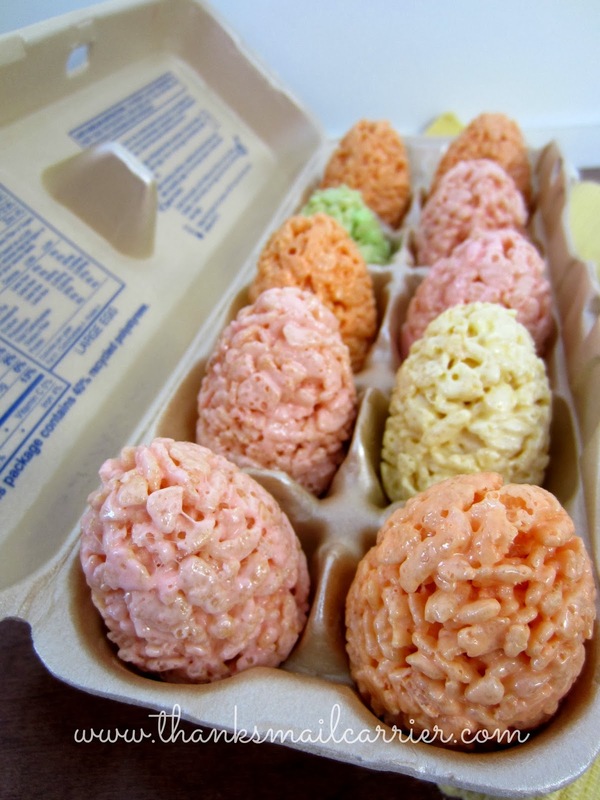 The Rice Crispy Treat eggs are very cute. I did go to Kraft and found a great recipe for Banana Caramel Toffee Cake. i want to try the deviled eggs with shrimp recipe. Hi! The deviled eggs with ham recipe sounds delicious. I'm going to make that!! Thanks! I'd like to try the Bacon-Wrapped Pork with Mango Salsa. I like the Juicy Egg Jigglers. The Oven-Baked Chicken Parmesan sounds good to me! Easy Cheesy Tortellini & Bacon and some of their pasta recipes. I would like to try the double lemon cheesecake bars. The rainbow stack cake looks great! I am sooooo excited to cook some nice spring desserts for my family!! I want to lighten things up after the hearty, rich dishes of the winter. I am especially excited about making this recipe for Lemon-Blueberry Swirl Cake (http://www.kraftrecipes.com/recipes/lemon-blueberry-swirl-cake-115867.aspx). It looks so light and refreshing! Might be topping it with some fresh berries and whip cream! The recipe I'm inspired to try this spring is the Frozen Raspberry Shortcake Squares! I think the Banana-Caramel Toffee Cake sounds yummy! I want to make the Flower Power Cupcakes recipe. I am most inspired to make the creamy layered fruit sensation dessert. This time of year, I love the spring veggies showing up in the market, and Kraft's recipe for Spring Vegetable-Rice Salad sounds lovely. Banana toffee caramel cake sounds yummy. I would love to try the Frosted Pink Lemonade Cookies. I want to try the double lemon cheesecake bars,chicken and mushroom penne pasta, and taco pasta toss. I would like to try their cheesy mushroom fish bake. i'm thinking we have to try Cheesy Cornbread Casserole! Bacon & Potato Egg Strata sounds yummy. I want to try the Flower Pot Cupcakes. They are adorable! The Triple Layer Lemon Pie is looking good to me right about now! I'm thinking about making the Balsamic Maple Glazed Ham for Easter. I like the Ultimate 7-layer dip. I like the recipe for spring blossom cookies. I'm going to make them! I would try the breakfast strata! Looks pretty good and large enough to feed the family. i am excited to try the double lemon bars. I would like to try the Peanut Butter Bunnycakes recipe. Thanks for the chance to win! I'd like to try the Ultimate 7-layer Dip! I would love to make the Mediterranean Stuffed Mushrooms. I would like to try the recipe for Creamy Lemon Squares. I would like to make Bacon, Bleu Cheese, Avocado, and Basil Pasta. The double lemon cheese cake bars look good. I love asparagus and my 6 year old daughter just tried it and like it. I think I would like to try the Asparagus-Pasta Toss. I'd like to try the bacon water chesnuts for spring! Their Rainbow Layer Cake looks amazing! I love the idea of using Jello to color the layers! What a surprise it will be to cut into this one! I would like to make bacon water chestnuts.. This Spring I might be inspired to make the Lemon No-Bake Mini Cheesecakes. The Flower Power Cupcakes are so cute! My daughter would love those! I would like to try the Lemon No Bake Mini Cheesecakes. Sounds yummy!!! I will definelty be making the double lemon cheescake bars !!!! The fudge-bottom candy crunch pie sounds amazing! The refreshing lemon tart looks good but I'd really like making these rice crispy eggs with the surprise inside. So need. I'll pin this for later. Double lemon cheesecake bar, yum! I think that we would love to try this recipe from Kraft recipes - 30-Minute Italian Pork Chop Dinner, uses Wishbone Italian dressing and it is fast and easy. I would like to try the fully loaded scalloped potatoes. The double lemon cheesecake bars sound delicious. I want to try making the Hip-Hop Bunny Cake for Easter, its just too cute! Bacon & Potato Egg Strata sounds yummy! I want to make the fully loaded scalloped potatoes. I would like to make their deviled eggs with ham recipe. I want to try the Asian Toasted Sesame Asparagus, my family loves asparagus any way it comes!! I would like to make the Easy Layered Boston Cream Pie. Our family loves mac and cheese. It would be nice to try a new variation instead of the same old boxed stuff. So I would like to try the Super Cheesy Baked Macaroni & Cheese recipe. The Double-Lemon Cheesecake Bars sounds just delicious! I would like to make the Southwest Black Bean Burgers. I've just gone vegetarian and this sounds delicious. Layered Pizza Dip for the win! I want to try the chocolate cheesecake recipe. The Rainbow Layer Cake looks fun! I would try the vegetable side dishes! I would like to try the Strawberry Shortcake Trifle! Double-Lemon Cheesecake Bars sounds great!! I would love to try to make the Easy Peanut Butter-Banana Cream Pie. I think that Hubby and the 'baby' would love it! I want to try the Lemon Tart. Now that looks refreshing!!! I would like to make the "Italian Chicken-Pasta Skillet". I would like to make the Deviled Eggs with Ham, and also the Double Lemon cheesecake bars. The Breakfast Strata looks yummy! Coconut Flake Angel Cake looks yummy! I would like to try out Lemon jello poke cake this summer. Sounds really refreshing on a warm day. What great ideas for Easter. My kids and I will enjoys making the Easter treats. I would like to try the Lemon Poke Cake. I am going to try the Asian Toasted Sesame Roasted Asparagus...our family enjoys asparagus and this would be a nice change. Those lemon bars with the blueberries on top will be great at my daughter's bridal shower this may! the classic angel cake with coconut flakes looks delicious! I'd add some chocolate mini-eggs on top to make it Easter themed! I like the Rainbow Layer Cake. I want to try the Mock Mimosa! The tuna cakes look good to me. I haven't had any for years. The Chicken 'n Waffle "Tacos" sounds like a fun recipe for family night. The grandkids would love them. I would love to try the Shortcut Carrot Cake. I'd love to try the mock mimosa! Sounds delish for a brunch! Double-Lemon Cheesecake Bars might just have a place on our Easter table. I would like to make the classic Angel Flake Coconut Cake or the banana pudding squares. I would love to make the Double Lemon Cheesecake bars! flower power cupcakes - yum!! Oooh, I'd love to make the Lemon No-Bake Mini Cheesecakes! I think the layer salad sounds pretty good. I would like to try the Easy Peanut Butter-Banana Cream Pie recipe. I would like to try to make the refreshing lemon tart recipe on their website.